In this lecture we will discuss three case histories of important eruptions that have occurred within recorded history. The eruption of Mount Vesuvius, Italy in 79 A.D., the eruption of Mount Pelée on the Caribbean island of Martinique in 1902, and the eruption of Mount St. Helens on May 18, 1980. Mount Vesuvius is located to the southeast of Naples, Italy along the Bay of Naples. Prior to the catastrophic eruption of 79 A.D. Vesuvius was considered an extinct volcano by the inhabitants of the area, who were flourishing at the height of the Roman Empire. The area northwest of Naples, known as the Phelegrean Fields, was known to be an active volcanic area, however. Nevertheless, When earthquakes became frequent in the Vesuvius area following a destructive 62 A.D. earthquake, they caused no alarm because earthquakes were common in the region. What we know of the eruption that took place in 79 A.D. comes from two different sources: (1) Two letters written by the Pliny the Younger, the nephew of Caius Plinius (Pliny the Elder), to the historian Tacitus concerning the death of his uncle. Pliny the Elder was an admiral in the Roman navy and well known in his time. (2) Information from geological and archeological studies that have examined the area around Vesuvius. We start with the account given by Pliny the Younger in his letters to Tacitus. About 1 P.M. on August 24, 79 A.D. the Plinys were in Misenum, about 30 km across the Bay of Naples from Vesuvius. A large cloud appeared above the volcano, growing rapidly, rising many thousands of meters and spreading out laterally in the atmosphere. Pliny the Younger states that the cloud had the shape of a Mediterranean pine tree, with a narrow trunk at the base, spreading out like branches above. Pliny the Elder was curious about the cloud and began to plan a trip across the bay to investigate. Before he could get his ship ready, he received word from people living closer to Vesuvius that people needed help, and his investigative mission became instead a rescue mission. He organized his fleet and set sail with the intention of rescuing people living near the base of the volcano at Torre del Greco. As he crossed the bay his ship was showered by hot ashes and pumice which accumulated on the deck. He soon found it was impossible to make the rescue attempt and he turned in the direction of the wind and instead landed at Stabiae, to the south of Vesuvius. At Stabiae, conditions were still mild and he encountered his friend Pomponianus who was trying to escape to the sea, but the winds were not favorable. In order to reassure Pomponianus that there was no danger, Pliny went to the local baths and sat down for a meal. As night came, Pliny retired for several hours of sleep. During his sleep tephra began piling up in the courtyard of the house and earthquakes and loud explosions occurred in the area of Vesuvius. Pliny awakened by the trembling and loud noises and conferred with Pomponianus. They decided that their best escape was to go to the shore and try to leave by ship. They tied pillows to their heads for safety from the falling pumice, but darkness enveloped the area as a result of the falling tephra, and it remained dark even after the sun should have come up. They eventually made it to the shore, but found that the wind was not blowing in a direction favorable to sail away from the area. Suddenly Pliny the Elder began to feel poorly. He laid down on a cloth near the shore and asked for water twice. Then sulfurous fumes descended on the area making staying put an unpleasant experience. Pliny rose to move away from the area, but fell dead. His friends thought that he had been poisoned by the fumes, but no one else was affected. His friends all later escaped. Three days later Pliny's body was found, unmarked by any damage. It is highly unlikely that Pliny died of poisoning from the fumes because Stabiae is so far from Vesuvius; it is more likely that he died from a heart attack resulting from his physical exertion in attempting to flee the falling ash. On the same morning that Pliny the Elder died, his sister and nephew were still in Misenum. Conditions there were also growing worse. Although Misenum was upwind from the volcano, there were still frequent earthquakes and the sky filled with ash and became dark. Pliny the Younger and his mother decided to leave their house and move farther away from the volcano. They set off in chariots, but the shaking of the ground and the accumulation of ash soon made it impossible to continue. They observed sharp retreats in the sea, followed by waves that crashed high on the shore, probably due to tsunamis as pyroclastic flows from Vesuvius entered the sea. They attempted to move farther inland, but soon the ash from the eruption became so thick that they were engulfed in total darkness. Pliny the Younger compared the darkness to that of a sealed room with no source of light. This lasted for many hours, but eventually the air cleared and they survived. The account given by Pliny the Younger says nothing about what happened to the towns of Pompeii and Herculaneum, close to the volcano. But his account of the "pine tree" like cloud above the volcano was the first description of an eruption column, and thus volcanic eruptions that produce eruption columns and fall deposits have taken on his and his uncle's name, and are referred to as Plinian eruptions. The fate of Pompeii & Herculaneum was later unraveled by geological & archeological investigations. Pompeii was located about nine kilometers down wind from Vesuvius, and was buried by ~ 5 meters of tephra. It was thus abandoned for hundreds of years. In 1595 some of the ruins of Pompeii were discovered. People then began to search for buried treasures. In the 1800s the pyroclastic material that had buried started to be removed to reveal a well preserved instant in time. The deposits show that a continuous rain of fall deposits, consisting mostly of pumice blocks and lapilli, fell on Pompeii. The falls, from a Plinian eruption column, where occasionally interrupted by surges and pyroclastic flows. Pompeii was downwind from the vent and received the greatest thickness of the Plinian fall deposit (see map, above). According to Pliny’s account, ash began falling in Pompeii about 1:00 PM. By about 5:00 PM it would have gotten thick enough that roofs would have started to collapse, resulting in some deaths. Falling pumice would not have likely killed people, but falling lithic fragments and collapsing roofs would have killed people. Otherwise, people were likely fleeing, staying indoors, or climbing to stay above the pumice. About 6:30 the following morning, the 4th collapse of the Plinian eruption column sent surge S-4 into Pompeii. This would likely have killed any remaining inhabitants, indoors or outdoors. This surge was quickly followed by surges S-5 and S-6 which was immediately followed by a pyroclastic flow, F-6, which buried the city further. These surges and later eruptions of accretionary lapilli and lithic surges, during a phreatomagmatic phase, completely buried Pompeii in up to 5 meters of pyroclastics. During excavations, many human fossils were found. The bodies had been buried in ash, and rain falling on the ash had cemented it together to form molds around the bodies before they decayed. After the bodies decayed an open cavity was preserved & archeologists made plaster of Paris casts of these cavities. Even animals (dogs, pigs, and horses) were found in the surge deposits. Many of the bodies showed that the victims had likely died of asphyxiation from breathing the hot gas and fined grained ash. Their hands were clenched around their mouths probably in an attempt to filter out the dust prior to their deaths. Many corpses were found clutching bags of gold that they had gathered in an attempt to flee. So far 1044 human remains have been found in and around Pompeii. 394 or 38% were found in the pumice fall deposits. 650 or 62% were found in the surge deposits. All of the casts of victims were made from remains found in the surge deposits. The destruction of Herculaneum was somewhat different. Herculaneum was located on the shore of the Bay of Naples at the base of Mount Vesuvius. Herculaneum has not been excavated to the extent of Pompeii because the modern city of Ercalono is built on top of it. It was buried by up to 23 meters of pyroclastic deposits. Instead of loose tephra fall deposits and thin surge deposits like at Pompeii, Herculaneum was buried by highly unsorted consolidated mixture of rock fragments & fine-grained ash erupted as pyroclastic flows and surges. These became partially lithified over time as a result of hot vapors flowing through shortly after the eruption and groundwater flowing through. Such consolidation makes excavation much more difficult at Herculaneum. Earlier geologic investigations suggested that these deposits were mudflows or lahars, but recent investigations show that they are instead deposits of pyroclastics the next thousand years. Within the 8 square blocks of Herculaneum that have been excavated, it first appeared that most of the residents had escaped death before the advance of the pyroclastic flows. But excavations near the ancient shoreline conducted in the 1980s found buildings supported by arched chambers open to the beach. Within these chambers and on the beach in front of them, over 300 skeletons were found. Thus it is likely that the residents ran to these buildings for shelter from the volcano or to escape to the sea, but were eventually engulfed in the pyroclastic flows and died. There were 6 main surges and pyroclastic flows that affected Hurculaneum. Surge S-1 killed everyone near the beach. Surge S-2 was somewhat larger and extended farther to the North. Surge S-3 reached the northern walls of Pompeii. Surge S-4 reached the interior of Pompeii and killed those that had survived the pumice fall. Surge S-5 buried Herculaneum even more and left a thin deposit in Pompeii. Surge S-6 reached south to Stabiae and Pliny the Elder, and reached west to Misinum and Pliny the Younger. Correlation between the deposits found at Pompeii and Hurculaneum as well as the timing of the various events as estimated by Haraldur Sigardsson and his colleagues, the volcanologists responsible for synthesizing the geological information discussed here, is shown in the panel below. Although Vesuvius has been intermittently active throughout the years since the 79 A.D. disaster, the population has returned to the Vesuvius area and Naples and its suburbs is one of the largest modern cities built in the danger zone of an active volcano. Mount Pelée is a volcano on the northern part of the French Caribbean Island of Martinique. The city of St. Pierre lies about 6km to the southwest of the volcanic peak on the shores of the Caribbean Sea. Prior to 1902, the last eruption from the volcano had occurred in 1851. Below is a chronology of events leading up to and including the devastating eruption that took place on May 8, 1902. January, 1902 - Fumaroles in summit crater increase in number and strength. March 2, 1902 - Climbers enter the crater and find that a dry lake bed in the crater is now emitting sulfur fumes from several points. April 23, 9:00 PM - Minor explosive activity takes place in the dry lake bed in the crater. Ash released consists only of pre-existing rock fragments. April 27 - An investigating party climbs into the crater and discovers that the dry lake now contains water and a small tephra cone. April 27 through May 4 - Explosions continue from the summit crater, with occasional ash falls and sulfurous fumes reaching St. Pierre. Still, all of the ash is pre-existing fragments of the volcano. May 5 - The water that has accumulated in the crater suddenly bursts through the walls of the crater and flows into the valley of the Riviere Blanche. As the water moves down the valley it picks up loose debris to become a mudflow that travels at 90 km/hr. It reaches a rum distillery near the coast, burying all but its smokestack, and killing 24 workers. The mudflow enters the Caribbean Sea and generates a tsunami with 3 to 4 m waves that flood the low lying parts of St. Pierre. Because an island wide election is to take place on May 11, political leaders encourage the populace to remain in the towns, villages, and cities to vote. Still, many people leave St. Pierre fleeing to Fort de France on the southern part of the island. Many more, however, flee the surrounding countryside and enter St. Pierre, boosting the population to about 29,000. A scientific commission is appointed to investigate the volcanic phenomena. One of the commissioners reports to the local newspaper that "Mt. Pelée presents no more danger to St. Pierre than Vesuvius does to Naples!" May 6 - Ash eruptions begin to contain new magma and a small lava dome forms in the crater. May 7 - Several small nuée ardentes flow down the Riviere Blanche valley as a result of small collapse events from the lava dome in the crater. May 8, 7:50 AM - A loud blast is heard from the summit of Mt. Pelée. May 8, 7:52 AM - All clocks in St. Pierre stop. A powerful nuée ardentes rolls down the valley of the Riviere Blanche. The densest part of the cloud remains in the valley, but part of the pyroclastic flow overtops the valley walls and engulfs St. Pierre. All but 2 people out about 29,000 are killed in the next 2 to 3 minutes. Ships in the harbor catch fire and sink. Walls up to 1 meter thick are knocked down, roofs are blown off, and many burn, iron bars are bent and twisted, but some areas of the city are affected more than others. Still, nearly all humans and animals die, even in parts of the city not knocked down by the blast. Many of the victims are badly burned, yet their clothing is not singed. Most appear to have died from asphyxiation due to breathing the hot mixture of gas and dust. One survivor was locked in a small prison cell with only a small barred opening on facing the north. His body was badly burned and he reported that the heat only lasted a few seconds. This survivor later joined the circus and traveled around the world telling his story of survival and showing his badly burned back. 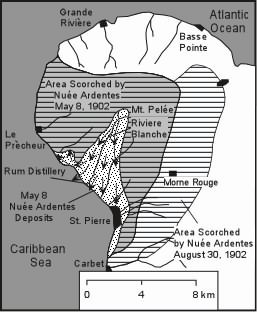 August 30 - A third nuée ardentes takes a somewhat different path, engulfing not only St. Pierre, but also the town of Morne Rouge where it kills an additional 2,000 people. This eruption is an extremely important event because it was the first time that the scientific community became aware of the phenomena of pyroclastic flows. In a 1975 volcanic hazards study of Mount St. Helens, U.S. Geological Survey geologists D.R. Crandell, D. Mullineaux and M. Rubin noted that Mount St. Helens had been built within the last 2,500 years with the last eruption in 1857. Major eruptions had occurred every hundred years or so and St. Helens was one of the most active volcanoes in the Cascade Range. In their paper they stated that Mount St. Helens "will erupt again in the next 100 years, perhaps before the end of the century." Mount St. Helens did reawaken on March 21, 1980 when a magnitude 4.2 earthquake occurred beneath the volcano. Earthquakes continued until March 27 when a phreatic eruption occurred at the summit. Similar small eruptions took place through mid April and the summit of the mountain developed a new crater due to the explosions. Note that only pre-existing rock fragments were ejected during these initial eruptions. By mid-April volcanic tremor had begun beneath the mountain indicating the movement of magma. By the end of April surveys showed that the north face of the mountain above an older volcanic dome, known as the Goat Rocks Dome, had begun to bulge upwards and outwards at rates up to 1 m per day. By May 12, the bulge had displaced parts of the northern part of the volcano a distance of about 150 m. Geologists now recognized that this bulge could soon develop into a landslide, but were uncertain when or if it would occur and how big the slide would be. Most of the area in the danger zone (called the red zone) had been evacuated, but intense pressure from people with cabins and homes within the red zone forced the Governor of Washington to open the area to allow land owners to return under police supervision to retrieve their belongings. The first of these escorted entries into the red zone took place on May 17, and a second caravan was scheduled for the morning of May 18. Fortunately the latter expedition was not scheduled to leave until 9:00 A.M.
At 8:32 AM on May 18, 1980 a magnitude 5.0 earthquake occurred beneath Mt. St. Helens. This led to a violent eruption that took place over about the next minute. The earthquake triggered a large landslide that began to slide out to the north, initially as three large blocks. As the first block, containing the old Goat Rocks lava dome, began to slide downward, the magma chamber beneath the volcano became exposed to atmospheric pressure. The gas inside the magma expanded rapidly, producing a lateral blast that moved outward toward the north. As the second slide block began to move downwards a vertical eruption column began to form above the volcano. The lateral blast rapidly overtook the slide block and roared through an area to the north of the mountain, knocking down all trees in its path and suffocating all living things, including humans. Within the next 10 seconds the third slide block moved out toward the north. All slide blocks banked up against the mountain north of Spirit Lake and were then diverted down the North Fork of the Toutle River valley toward the west, breaking up into smaller blocks as they moved down slope. The landslide thus became a debris avalanche and left a deposit extending about 20 km down the valley (see map below). The southern shores of Spirit Lake were displaced about 1 km northward and the level of the lake was raised about 40 m. Harry Truman's Lodge was buried by the debris avalanche. Within about the first minute of the eruption the lateral blast had ceased, the debris avalanche had been deposited, and the summit of Mount St. Helens had been reduced by about 500 m. The magma however continued to erupt in a Plinian eruption column that reached up to 26 km into the atmosphere. The eruption column collapsed several times to produce pyroclastic flows that moved into Spirit Lake and the upper reaches of the Toutle River Valley. This Plinian phase lasted about 9 hours and spread tephra in a plume to the east, darkening the area at midday to make it appear like night. During this first minute of the eruption everything within the lateral blast zone had been knocked down and covered with a thin layer of ash. Trees along about a 100 m wide zone surrounding the blast zone had been stripped of their vegetation or severely singed to a brownish color. In all, 62 people lost their lives, either by being buried by the debris avalanche deposit, or suffocating by breathing the hot gases and dust of the blast. Some also died in the cars or trucks when pieces of wood were driven through the cars by the blast. Over the next several days melted snow combined with the new ash to produce mudflows that roared down the North and South Forks of the Toutle River and drainages to the south of the volcano. Logs were carried into the Columbia River and so much sediment accumulated in the shipping channel of the Columbia River that it cost several hundred million dollars to dredge the channel and remove the logs so that shipping could continue. Eastern Washington was covered in volcanic ash for months after the eruption and relief efforts were slow. Although the tephra fall deposits that accumulated in eastern Washington were anticipated by the prior volcanic hazards study, most planning for rescue and recovery had concentrated on the area immediately around Mount St. Helens. In general, the eruption had been much larger than most anticipated, but the fact that a hazards study had been carried out, that public officials were quick to act and evacuate the danger zone, and that the volcano was under constant monitoring, resulted in the minimization of loss of life to only 57 instead of a much larger number that could have been killed had not these efforts been in place. Since the 1980 eruption, several volcanic domes have been emplaced in the crater and some have been blasted out. In the future, it is expected that new domes will continue to form, eventually building the volcano back to a form that will look more like it did prior to the 1980 eruption. What types of volcanic activity was responsible for most of the deaths from each of the eruptions discussed? What types of volcanic hazards were observed and reported for the first time at each of the following eruptions? (a) Mt. Vesuvius, 79AD, b) Mt. Pele, 1903, and c) Mt. St. Helens, 1980. Why do mudflows (lahars) commonly accompany volcanic eruptions? Are mudflows on volcanoes possible without eruptions? Each of these case histories introduced scientists to phenomena that they had not previously observed or understood. What were these newly observed phenomenon for each case history discussed?